*AVANI Hotel has been booked out on certain dates, please click the link to view dates available or to check more options. 1.The above rates are quoted in Thai Baht (THB) per room per night, Room rates include daily International buffet breakfast the hotel outlet, and inclusive of 10% service charge and 7% government tax. 2.Cancellation before 15 days upon arrival or no show, there will be charged of the whole period of rooms nights. Visitors to Thailand must obtain a visa from one of the Thai diplomatic missions unless they come from a visa-exempt country or a country whose citizens are eligible to obtain visas on arrival. Thailand currently offers visa-free travel to nationals of 57 countries and territories. The Thai government maintains bilateral agreements on visa waivers with some of these countries. Nationals of 21 countries can obtain a visa on arrival. List of Visa Exemption and Visa on Arrival to Thailand. For more information about Visa to Thailand, click here. 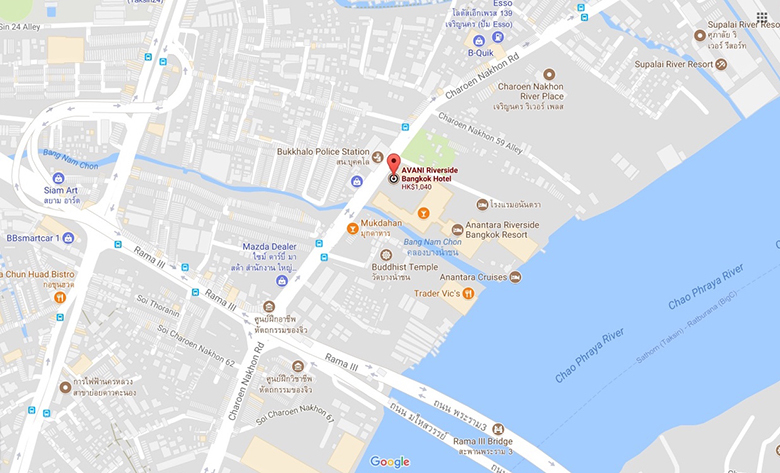 Please click here to search the route from your location to AVANI Riverside Bangkok. Airport transfers can be arranged by AVANI Riverside Bangkok Hotel. Their airport representative will meet you at arrival Gate 5 and whisk you directly to the hotel. Via a Mercedes Benz E-Class 300, the transfer is THB 2,500 one-way, and THB 4,800 round-trip. Via a Mercedes Benz Vito, a one-way transfer is THB 3,500 and THB 6,600 round-trip. Limousine service can be reserved by calling +66 2 476 0022. Public taxis are available from the pick-up stand at the airport. To take public transportation to the hotel, take the Airport Rail Link and connect to the BTS Skytrain. Exit at Saphan Taksin and board our complimentary shuttle boat. Board our complimentary shuttle boat between the Saphan Taksin BTS Skytrain station and our hotel. AVANI’s complimentary shuttle boat also runs to the Asiatique Night Market. Click here for the shuttle boat schedule. Download our handy location map.